Ravenwood Ranch is an award winning multi-generational family farm located in central Alberta on the banks of the Raven River. We have dabbled a bit in everything from dairy to food service to hogs to agritourism to meat processing. 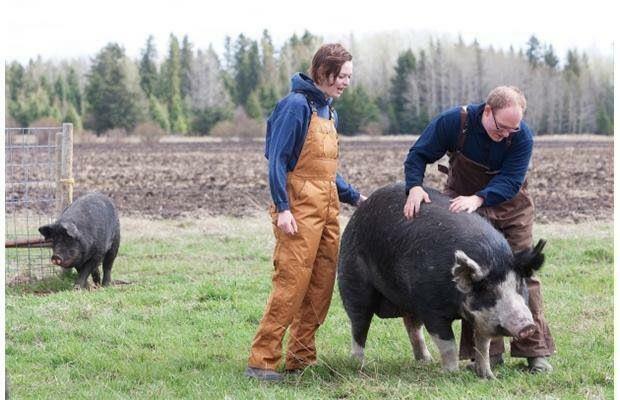 For 5 years we owned a butcher shop and pasture-to-plate cafe in Caroline. We closed down that location early in 2013 to focus on our farm and family of 4 little boys. 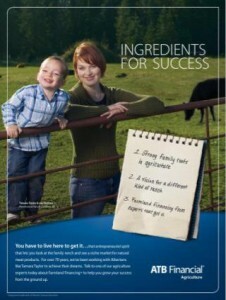 Please have a look at our farming philosophy. My husband, Mark, and myself both grew up in farm families. Mark’s family operates a large grain farm in Saskatchewan and my family raises Beefbooster cattle on their ranch near Caroline. Mark and I met while pursuing degrees through the University of Saskatchewan. Mark attained a Bachelor of Science in Biology and a Masters of Science specializing in canola and nectar production. I attained an Animal Science degree. You can read more about my qualifications here. We were married in 2002 and moved back to Alberta to pursue our careers in 2004. Mark took a position as a crop research station manager while I worked as a dairy plant quality assurance lab technician. 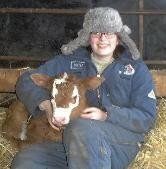 What teenaged girl wouldn’t want to grow up on a farm looking this glamorous? In 2005 our first son, William, was born and everything changed. We suddenly realized that we wanted to live in the country, raise our kids at home and not put them in daycare. We knew that we wanted to be our own bosses and have a career that would give us the flexibility and lifestyle we desired for our young family. We also knew that agriculture was a field we both knew and loved. Now if we could only find a way to make it our job! We started out by moving back to my parents beef ranch and purchasing a herd of Savanna meat goats and a herd of Berkshire pigs. We knew that there was no way we could compete with the “big guys” so our focus was niche marketing pasture meat products. We felt confident that we could offer a quality, wholesome product that would give consumers an alternative to conventionally raised meats. We felt that consumers would seek out a product that has been raised in an environmentally responsible and ethical manner. We found our niche by offering Heritage breed livestock raised outdoors. We partnered with my parents who raise Beefbooster cattle on the ranch, as well as offer a lot of support and time towards the swine and goat herds and the store. By 2008 our little operation had grown. Our second son, Nathan, was born that summer. We decided to ”up the marketing” of our products and opened a farm fresh store. Not only did this give us a retail outlet for our products, but it also allowed us to showcase other local area producer’s products that were raised using similar methods and philosophies as those we employed here on the ranch. By fall of 2008 we were offering our own pork, beef and chevon as well as other farmer’s bison, venison, veal, lamb, chicken, spices, marinades and cheese. The beginning of 2009 brought the beginning of renovations to expand our store to 3000 square feet including a butcher shop, bakery, expanded seating area, deli and smokehouse. In addition to the old fashioned butcher shop we also offered custom cutting and wrapping on other farmers’ livestock as well as wild game. 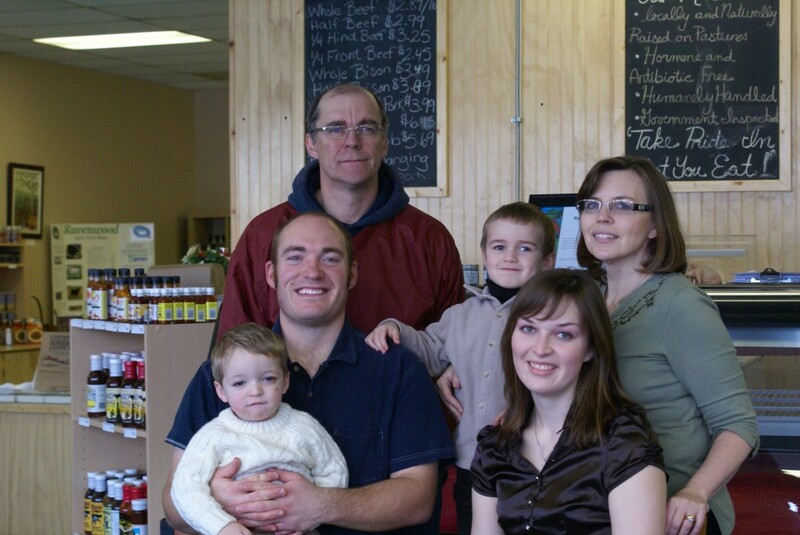 Our family opening the expanded meat store and cafe. We were thrilled and overwhelmed with how well received the store was. We attracted customers from across Alberta and garnered a few articles in various publications. We received a APF Best Practices Award (2009), were finalists for the Outstanding Young Farmers’ Award (2010), nominated to attend Terra Madre (2010) and finalists for a Nuffield Scholarship (2010). We even had the pleasure of being “spokesmodels” for the Alberta Treasury Branch when they ran a campaign for agriculture lending. It was pretty cool to see our smiling faces on billboards in the big cities. During this time I was diagnosed with an autoimmune disease and life got a lot more difficult. Daily life can be a real struggle sometimes. Then in 2012 we were doubly blessed with the arrival of our healthy twins bringing our family up to a total of 4 wee gents. At this time we decided we needed to re-prioritize life. The business had grown so much larger and quicker than we had ever anticipated. We decided to sell the retail location, butcher shop, cafe and focus on our priorities: our family, our farm and our health. Today we are enjoying raising a wide variety of quality livestock. Animals have always been a passion for me throughout my whole life. I am so thrilled to be able to share this love and wonder with my own kids. We do offer breeding stock from time to time and are always happy to answer questions from those who are embarking on their own farming journey. 🙂 I have such a passion for these beautiful creatures and I would be thrilled to share them with you. Bouncing baby bunnies. How do you find a teat when you can't see or hear? You throw yourself around with your mouth open til you latch onto a milk spout. It's amazing to behold! Lunch date with Allen! Baby boy came to work with me for his final puppy vaccines. He weighs 19.3 kg 😲 at 3.5 months old. Bananas!! We started clicker training this week and his eagerness and willingness have made for a very fun adventure thus far. He's shaping up to be a wonderful guy. I like big chickens and small goats. They are getting their little twiggy legs figured out and living their best goatie lives doing adorable goatie things.